Need a signature? Arrow shaped page flags direct attention immediately to where it's needed saving you, your clients and your co-workers time. Color coordinate the signatures you need by assigning a different color for each person who needs to sign with red, yellow, blue, orange and green page flags. Removable adhesive allows you to reposition and reuse flags and the non-adhesive half extends past the edge of the sheet to grab attention. 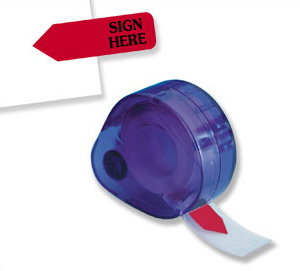 Packaged in refillable, easy to use dispensers to help save money too.